Tampa Bay Brewing Co. has announced a refreshed logo and branding, along with a new look for its cans. "Like most mature organizations, our brand identity has slowly morphed over time and was due for a more significant refresh to better reflect our spirit and uncorporate culture," said Managing Partner David Doble in a statement released by the brewery. "Furthermore, both internally and on the street, people have been referring to us as TBBC for years ... This was a rare opportunity to embrace the community-given nickname in a manner that was not confusing to our long-standing customers." February 16, 2018, Tampa, FL: One of Florida's oldest independent craft breweries, Tampa Bay Brewing Company ("TBBC"), has announced expanded distribution plans as it heads into the greater Jacksonville market beginning the week of February 19. TBBC has partnered with Champion Brands to bring its beers to Northeast Florida, and introduction of the TBBC beers will take place at launch events around the area. TBBC was established in Tampa in 1995. Its original brewery and brewpub is located in the heart of Ybor City. In 2015, TBBC opened a second production brewery and brewpub in Northwest Tampa, with a 30-barrel brewhouse and packaging line capable of producing nearly 20,000 barrels per year. It is on schedule to exceed 16,000 barrels in 2018. TBBC is a mainstay at beerfest events around the state. Its core brands, Reef Donkey American Pale Ale and Old Elephant Foot IPA, are available in draft and in cans in the Tampa area as well as other markets. These will now make their way into the on-premise and retail accounts throughout the Jacksonville market, along with seasonal releases, including Quat, a golden kumquat ale. 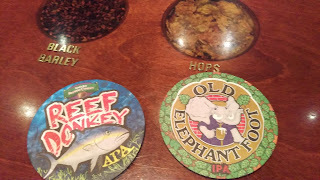 TBBC earned a Bronze Medal at Great American Beer Festival in 2014 for its Reef Donkey Pale Ale, a citrus/tropical ale, which is named after a slang term for the amberjack fish. "We sold our first keg via distribution in November 2011," said David Doble, TBBC Managing Partner in a statement obtained by this site. "Since then, we have taken a steady, organically driven approach towards opening new markets throughout Florida." While TBBC saw "pent-up demand" for its products through Florida and even beyond, TBBC has been "careful not to rush, taking our time to find the right distribution partners, and most importantly, to ensure that the quality of our product and service we provide does not suffer at the hands of growth for growth's sake," Doble added. Members of the TBBC team, including David Doble, Head Brewer John Rankin and Director of Sales Nicole Calvin, will be in Jacksonville during the week of February 19 during the rollout events. On the partnership with Jacksonville-based Champion Brands, Doble expressed excitement to work with the distributor "due to the reputation, experience, and commitment to supporting independent craft breweries" that Champion brings. "They are continually innovating and have a culture that aligns with ours, casual but serious." February 21 at Really Good Beer Stop, Jax Beach, at 6pm; and at an additional location to be announced. Welcome Tampa Bay Brewing to Jax!